I finally blocked the Birthday Pi, and then finally got around to taking some pictures! This thing is big--for perspective, that's a queen-size sheet it's blocked on. Designers and magazines, of course, need clear shots of the finished product so that knitters know what they're getting. But those photos just aren't as interesting. Granted, I'm no photographer, and the Irishman is terrible. (Why do you think I only have him take pictures when it's absolutely necessary?) But so often in modeled shots I find myself dwelling on the model rather than the knitting. Not to mention that the best glimpse of the patterning and architecture of a lace piece comes from blocking photos--and magazines never print those! This may be sour grapes, but nevertheless--aren't these pictures cool? P.S. Anyone need a tablecloth? Having finished knitting my alpaca sweater, my Maplewing, and even the latest pair of Mindless Socks, I have brand new knitting! The pattern is Fir Cone lace; I thought it looked very nice with the greens and browns of the yarn. But you'll have to take my word for it until it's blocked. Two of my dear friends are getting married in July. Jen said to me the other day, "you know, all the wedding dresses came with stoles and I kind of sneered at them . . . but it's going to be cold, isn't it?" (Idaho is not humid. Even in July it will be cold after dark.) And so I volunteered to knit her a shawl. I'll be knitting another on slightly bigger needles to see if I like the fabric better. The shawl is obviously the most pressing at this point--I don't want to be blocking the night before the wedding--so I'll be fairly monogamous for awhile. That doesn't keep me from dreaming, though . . .
Yarn is Tofutsies on a 0/2.0mm needle. As always, very happy with this yarn, especially at a nice tight gauge. These are off to a family friend to keep her toes warm. Yarn: Henry's Attic Prime Alpaca , 665 yd/227 g, 2 skeins, colorway Charcoal. It was a bit of a pain to work with--splitty and with no give in that alpaca way--but the resulting fabric is divine and the sweater is soft, warm, and lightweight. The fit is better than that pattern would have you believe. The shoulders are perfect, which is a big improvement from the Boyfriend Sweater debacle. And this one is pure silliness. Finally, I got a picture of the Irishman wearing his Zig Zag socks. Yarn is the wonderful Sweet Georgia Tough Love Sock, which I'm confident will hold up to his prolonged abuses. 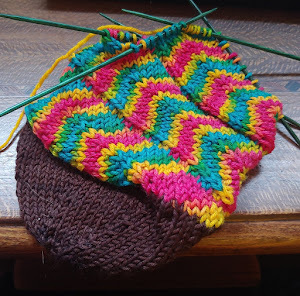 I completed a total of six pairs of socks in 2011--not as many as the 11 I'd hoped for, but half a loaf is better than none, eh? And maybe this year I'll set my goal at 12 . . .